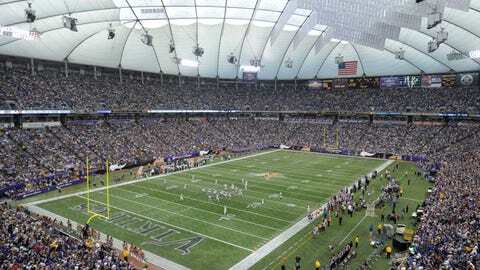 The Minnesota Sports Facilities Authority still has yet to figure out exactly what to do with the Metrodome seats once the final Vikings game is played Dec. 29. More than 70 groups have inquired about obtaining seats. "We’re just trying to first of all collect all the information of the cost to separate the seats and unbolt them from the concrete slabs and move them, so that’s one thing," Kelm-Helgen said. "One way or another, as long as our costs are covered, for those 70 groups of schools, colleges or non-profits, we will make those seats available to them. What happens to the rest of the seats as far as some individual requests — some businesses have requested — we’re looking at putting together an overall strategy." "We clearly would like to accommodate those requests," Kelm-Helgen said. "On the other hand, I’m not sure that even if we just had them pay the cost of removal, which is $50 a seat, whether that’s realistic." "I think we understand their position," Eidem said of the MSFA. "I would say we’re not disappointed with the Sports Facilities Commission or any of those folks. They’re under quite a bit of scrutiny just because of the way the funding has gone with pull tabs and everything else. I get it. If they start donating things from the Metrodome to local groups, then the other end of people is upset, ‘Why are you donating things you could be selling?’"
"Because it’s not like a removable turf, per se, when you take that up it’s going to come up in kind of chunks where it’s not going to make it really reusable, I’m told," Kelm-Helgen said. "It’s just not practical to think about that turf. There are some kinds of turf that are removable where some stadiums actually have different types for different events. That’s not the case here." For those hoping to witness a giant implosion of the Dome, you’re out of luck as that won’t be happening. A "somewhat traditional demolition" will be used, Kelm-Helgen said, using wrecking ball and cranes instead to tear down the stadium that has housed so many moments over the last three decades. "I wouldn’t be at all surprised if that happens," Kelm-Helgen said. "I think it definitely will attract some attention."